Right now that I am writing to you, I have “study music alpha waves” BLASTING on my laptop in an attempt to persuade Loulou that she is actually really sleepy and there is no way to escape her 11:00 nap. I know it’s already 12:00, but the point is she needs to rest. And I need to drink that cup of coffee that I started at 8:45 and is now completely cold. As most of you know from personal experience, life with a little one can be draining. And if you are breastfeeding, it can be draining in a literal sense. 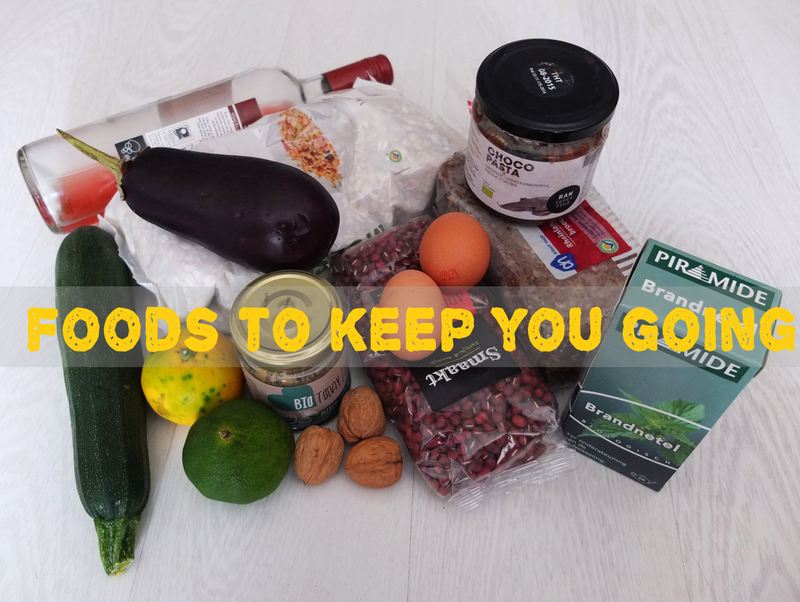 But even if you are not a parent, but a hard-working individual or student, my list of foods will help you get through the day without junk. Don’t pay attention to the brands of the products. It’s just what I can find where I live. I am sure you can find similar ones where you live and they will be equally tasty, if not more. So no worries. Don’t they all look delicious? I will not go into too much detail regarding the nutritional value of those things. A quick google search will help you figure that out. After all, if you were looking online for “foods to keep you going”, you probably need a quick fix and not a nutritional encyclopedia. Whole grain bread. Tons of fiber, complex carbohydrates that provide you with a steady stream of energy and even some protein are packed in there. Dark chocolate spread. Try to find one made of coconut sugar and that does not contain palm oil. Dark chocolate is full of antioxidants (you know, forever young) and it contains a small amount of caffeine that will help keep you awake without causing you jitters. Nut butter. Sesame seed paste (tahini), peanut butter, almond, walnut, cashew, sunflower seed butters are all excellent choices. BUT take a close look at the ingredients. If it is “30% peanuts”, what the hell is the rest? Only buy nut butters that contain more than 80% nuts and the rest is some natural oil. Yes, they are pricey, but they have a great nutritional value as well. Beneficial fatty acids, proteins and antioxidants are some of the main star ingredients. Oatmeal. You can enjoy it with milk or a dairy-free alternative as well as berries and super foods, like chia seeds, flax seeds and goji berries. Oatmeal is very rich in fiber and calcium and it is a decent protein source as well. Nettle tea. Nettle tea does taste a bit like boiled grass, but it’s easy to get used to the taste and with a teaspoon of honey it becomes really pleasant. Nettle tea is rich in iron. I have written more about it here. Eggs. Now, as many of you know, before getting pregnant I was vegan. I am now a vegetarian and as much as I know that this will upset my vegan readers, I want to be honest with you. Eggs (particularly the yolk) are packed with B vitamins, including vitamin B12, vitamins A and D, iodine, selenium and choline. Make sure to buy organic eggs, to avoid all the antibiotics that chicken farms pump the hens with. Am I aware that there is a lot of cruelty involved in the egg industry? Yes. Do I trust B12 supplements to provide adequate nutrition for my exclusively breast-fed child? No. Olive oil. Rich in antioxidants and high in calories, olive oil offers an excellent energy boost to your system. You enjoy its maximum health benefits when you consume it raw, so add it in salads or at the end of your cooking. Olive oil should NOT be heated to smoking point. Organic produce. Fine, regular produce will do too. But especially if you have a kid, do invest in organic produce, especially when it comes to the dirty dozen. We have been ordering local organic produce from EKOnoom for a couple of weeks now and the quality and taste are amazing. I thought pears were the most boring fruit in the whole universe, but those organic ones are the first to disappear from our fruit basket. Coffee. Preferably filter coffee and preferably black. If you can stick to 2 cups a day, you offer your body some valuable antioxidants, without going crazy. Remember that coffee is a stimulant and caffeine is addictive, so don’t overdo it. Because, trust me, when you try to quit coffee after you have been drinking 6 cups a day, life is HARD. Wine. Well, wine does not exactly keep you going, but it does help you unwind and a glass or two of wine per day is good for your heart, as it is rich in phenols. Here is a list of wines with the most health benefits. Legumes. Be it beans, lentils, chickpeas or whatever of the legume variety you prefer. It’s totally fine to buy them canned, just make sure they don’t have a ton of additives. Eat them with eggs for breakfast and add them in salads and soups or make them into dips. They will give you a load of B vitamins and protein. Water. I put it at the end of my list because I am really bad at drinking water and I feel guilty about it. But the truth is that water is one of the most important things you can provide your body and mind, to help them function optimally. Especially if you are breastfeeding, do drink up, otherwise you are putting your milk supply in risk. I won’t tell you to drink 8 glasses a day, but do drink as much as you can. Have a water bottle next to you at all times. Needless to say that a good night’s sleep and a bit of exercise will help you feel alive as well, but I am not going to talk about those things, before I sort them out for myself.